Have worked on the olive grove painting a few times since starting it, it looks like this now. Some homemade slide shows below. The single right arrow starts an automatic cycle, the double right arrow can be used to cycle through manually. The older process photo series has moved to the process archive, see link above. 5-13: Traditional glue gesso on panel offers a great many approaches depending on how it is configured. 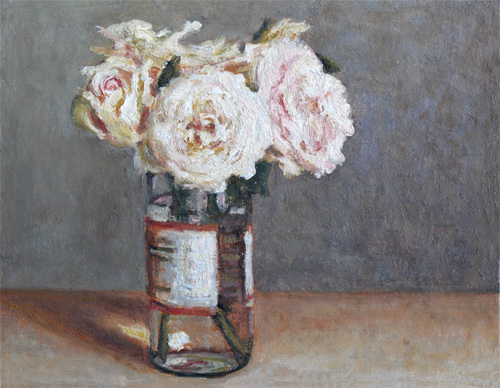 This version uses a slightly absorbent ground to generate, then refine, overall impasto at a relatively small scale. 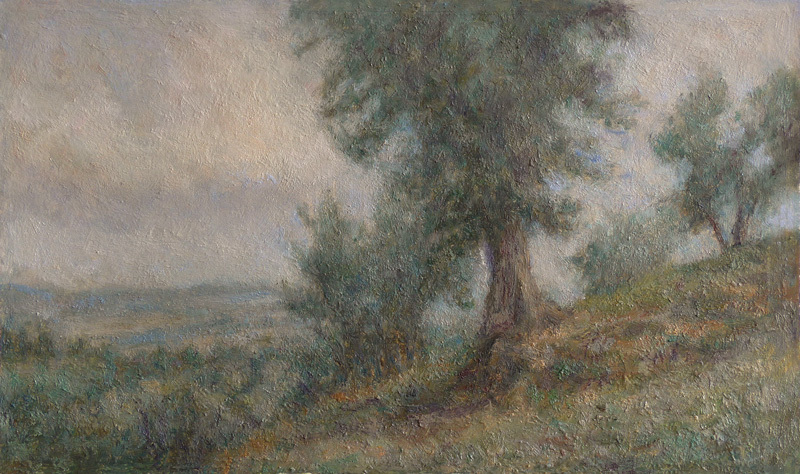 About 9x14 inches, oil on gessoed panel. 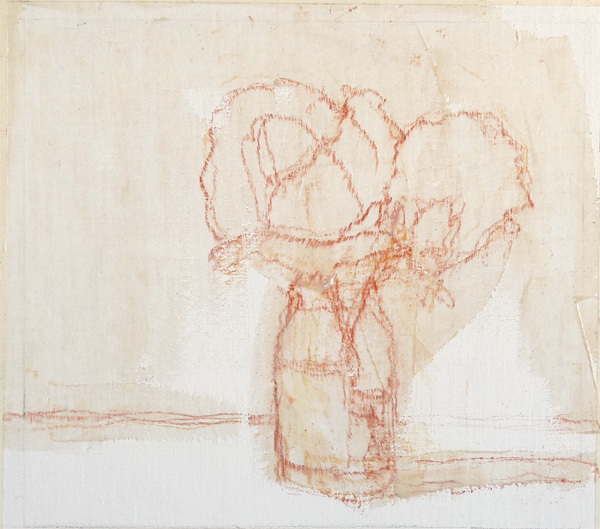 1)The drawing was done from a photo of the last version of the painting in red chalk on a panel with a glue gesso ground. This was then covered with a thin, light gray (pigmented) layer of chalk putty. The large grid allows the composition to continue to be interpreted. 2-13: The medium allows a great many different approaches from tight to loose. This is an image that had become too labored, not once, but twice, so it seemed best to approach it with more oomph. This meant using a silica gel medium with added thicker oil, then some chalk on the palette to tighten the paint again as needed. The trick with this type of approach is the balance between organization and the accidents of a more visceral approach. 1)first pass, looking for composition and shadow structure, the simplicity underlying something complex. 5-12: An example of starting a somewhat detailed image out of focus and relatively carefully in order to be able to complete it without too much backtracking. 13.5 x 15.5 inches, oil on gessoed linen over panel. 1)First layer, looking for atmosphere, not specifics. This is about looking for a way to make relatively complex landscape work without the specificity taking over too soon. Each image in the series below represents a session with the painting, after which it is allowed to dry fully. 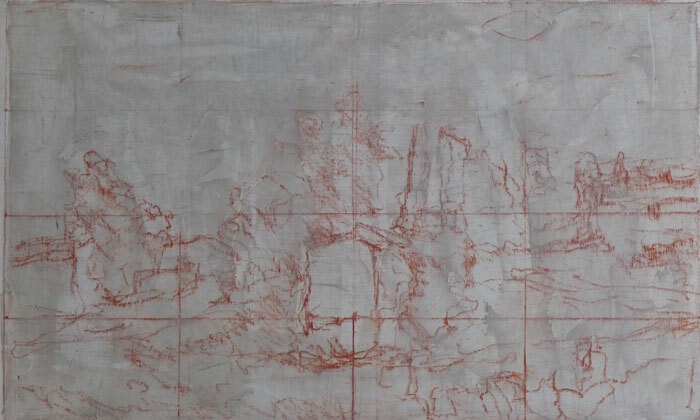 1)First underpainting, burnt sienna dark and white on gessoed linen. Looking for energy and unity, not specifics. 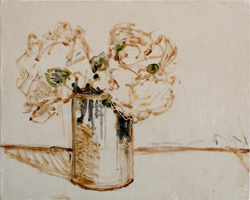 Small alla prima study of poppies from an old photo, originally done from life long ago. It's interesting now and then to revisit a more iconic iconic image from the past, see what changes in the execution. Shows how a putty couch can be used to begin with a broken surface, alternating warm and cool tones until the paint blends naturally. This of course could be stopped at a more broken or Impressionist place. A key to working fast like this is mixing the general colors on the palette first, about a dozen including a generic color of light and shadow. 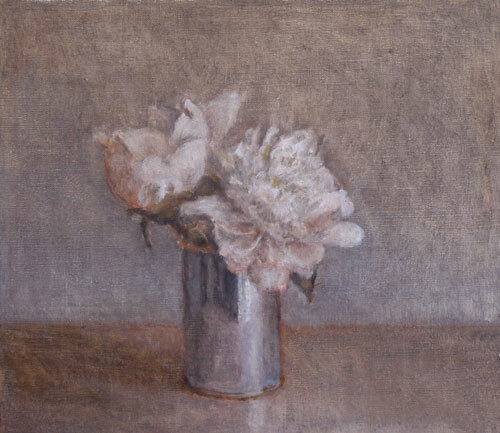 As such, no pure white was ever used in this painting, brightness is created optically, through shifts in temperature. Which has always proven to make things much simpler. 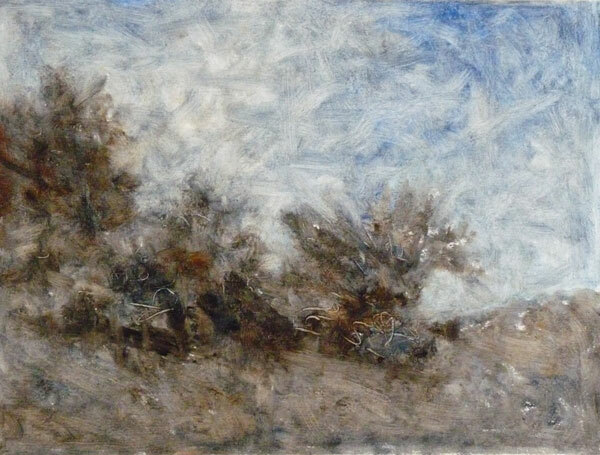 10.5 x 9.5 inches, oil on gessoed linen over panel. 1)Drawing is kept simple to facilitate interesting edges. Dense putty is troweled thinly onto entire panel. For a while I've thought about using the putty medium directly to make paint with dry pigments on the palette. As usual, this proved a little more complex in practice than in theory, but I was able to pull the image below together within the confines of the alla prima code. Barely, ran into lots of issues as you'll see. But the system proved resourceful, a good omen. Just used six colors and white, re-made the paint several times, learned more as I went. A larger size, 12x16 inches, beginning from an actual drawing again. This system seems to offer the potential for a more finished painting which still has the alla prima punch. 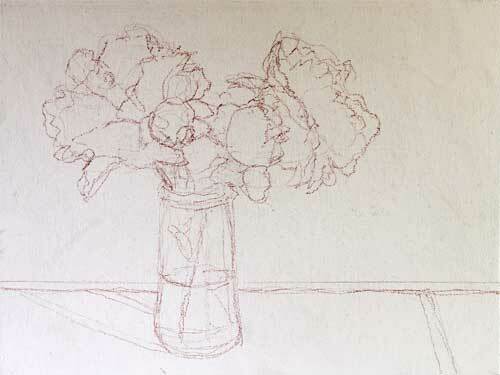 1)Simple red chalk drawing on gesso, just the general outlines. Last year, 2007, I made many different putty variations. One that was interesting but which I didn't quite get at first was a transparent gel made with oil and fumed silica. Below is a test study using this gel as a couch over a warm, midtone ground. The paint itself is still extended with the chalk putty, but it is sitting in a firm but slippery layer of the gel. 1)Slidey silica gel couch over midtone ground with transparent darks. I have no idea what this stuff is going to be like. Sometimes a panel doesn't work out, If it's an outdoor painting I can go back to the same spot and try again, or wait a year or so and grind it back. The image here had tons of paint on it, so I ground it back first, almost flat. Next is covering the old painting with a dense, dry putty, then put on the silica gel couch over that: it's more slippery, so it doesn't pick-up much. The idea with the style is to make a single thick and juicy layer of paint that will make sure the older painting never strikes through. Palette is earth colors and the transparent oxides. 1)Covering up the old painting, dense putty with gold ochre and lead white. Below is an example of a study done with the simplest triad, yellow earth, red earth, and black, colors which are at the foundation of many older paintings. 1)Another clean-up pass, dry paint, no couch. 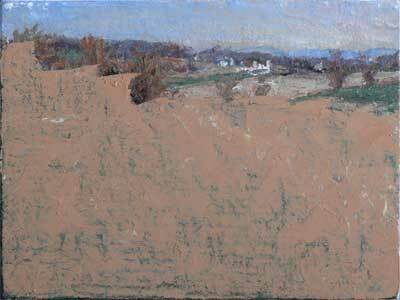 Below is a slideshow of the direct method: no color mixing, used with the putty medium in the first layer of a landscape. 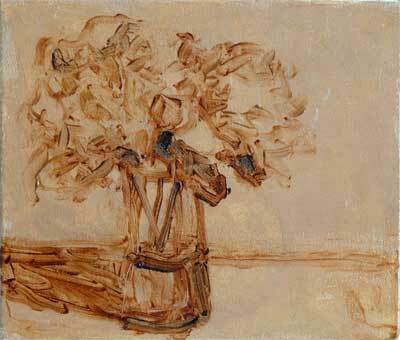 A dark, transparent triad of ultramarine blue, anthraquinone crimson, and raw sienna dark is used in the beginning. Then some white and a lighter but more opaque triad of manganese blue, golden ochre, and yellow ochre is added. An experiment to see how much can be built into a single layer in terms of color and viscosity shifts. 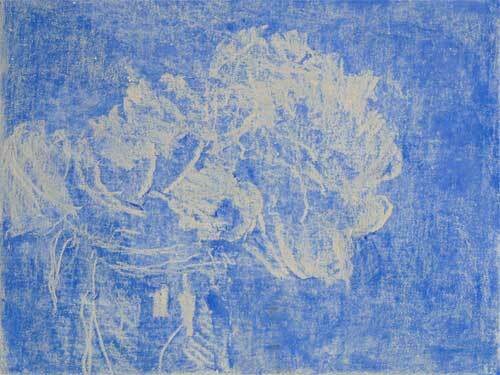 1)Began with a stiff putty toned with cobalt blue, then carved back into it for the lights. Kept it loose. copyright © 2002-2019 by Tad Spurgeon. All rights reserved. web site design by Axis Web Design.